Cancer is a medium-sized constellation that is bordered by Gemini to the west, Lynx to the north, Leo Minor to the northeast, Leo to the east, Hydra to the south, and Canis Minor to the southwest. The three-letter abbreviation for the constellation, as adopted by the International Astronomical Union in 1922, is 'Cnc'. The official constellation boundaries, as set by Eugène Delporte in 1930, are defined by a polygon of 10 sides (illustrated in infobox). In the equatorial coordinate system, the right ascension coordinates of these borders lie between 07h 55m 19.7973s and 09h 22m 35.0364s, while the declination coordinates are between 33.1415138° and 6.4700689°. Covering 506 square degrees or 0.921% of the sky, it ranks 31st of the 88 constellations in size. It can be seen at latitudes between +90° and -60° and is best visible at 9 p.m. during the month of March. Cancer is the dimmest of the zodiacal constellations, having only two stars above the fourth magnitude. The German cartographer Johann Bayer used the Greek letters Alpha through Omega to label the most prominent stars in the constellation, followed by the letters A, then lowercase b, c and d.
Also known as Altarf, Beta Cancri is the brightest star in Cancer at apparent magnitude 3.5 and located 290 light-years from Earth. It is a binary star system, its main component an orange giant of spectral type K4III that is varies slightly from a baseline magnitude of 3.53—dipping by 0.005 magnitude over a period of 6 days. An aging star, it has expanded to around 50 times the Sun's diameter and shines with 660 times its luminosity. It has a faint magnitude 14 red dwarf companion located 29 seconds away that takes 76,000 years to complete an orbit. Altarf represents a part of Cancer's body. Iota Cancri is a wide double star. The primary is a yellow-hued G-type bright giant star of magnitude 4.0, around 300 light-years from Earth. It spent much of its stellar life as a B-type main sequence star before expanding and cooling to its current state as it spent its core hydrogen. The secondary is a white main sequence star of spectral type A3V and magnitude 6.57. Despite having different distances when measured by the HIPPARCOS satellite, the two stars share a common proper motion and appear to be a natural binary system. Located 174 ± 9 light-years from Earth, Alpha Cancri (Acubens) is a multiple star with a primary component an apparent white main sequence star of spectral type A5 and magnitude 4.26. The secondary is of magnitude 12.0 and is visible in small amateur telescopes. Its common name means "the claw". The primary is actually two very similar white main sequence stars that are 5.3 AU distant from each other and the secondary is two small main sequence stars, most likely red dwarfs, that are 600 AU from the main pair. Hence the system is a quadruple one. Zeta Cancri or Tegmine ("the shell") is a multiple star system that contains at least four stars located 83 light-years from Earth. The two brightest components are a binary star with an orbital period of 1100 years; the brighter component is a yellow-hued star of magnitude 70000.0 and the dimmer component is a yellow-hued star of magnitude 6.2. The brighter component is itself a binary star with a period of 59.5 years; its primary is of magnitude 5.6 and its secondary is of magnitude 6.0. This pair will be at its greatest separation in 2018. Ten star systems have been found to have planets. Rho-1 Cancri or 55 Cancri is a binary star approximately 40.9 light-years distant from Earth. 55 Cancri consists of a yellow dwarf and a smaller red dwarf, with five planets orbiting the primary star; one low-mass planet that may be either a hot, water-rich world or a carbon planet and four gas giants. 55 Cancri A, classified as a rare "super metal-rich" star, is one of the top 100 target stars for NASA’s Terrestrial Planet Finder mission, ranked 63rd on the list. The red dwarf 55 Cancri B, a suspected binary, appears to be gravitationally bound to the primary star, as the two share common proper motion. Cancer is best known among stargazers as the home of Praesepe (Messier 44), an open cluster also called the Beehive Cluster, located right in the centre of the constellation. Located 577 light-years from Earth, it is one of the nearest open clusters to our Solar System. M 44 contains about 50 stars, the brightest of which are of the sixth magnitude. Epsilon Cancri is the brightest member at magnitude 6.3. Praesepe is also one of the larger open clusters visible; it has an area of 1.5 square degrees, or three times the size of the full Moon. It is most easily observed when Cancer is high in the sky. North of the Equator, this period stretches from February to May. Ptolemy described the Beehive Cluster as "the nebulous mass in the breast of Cancer." It was one of the first objects Galileo observed with his telescope in 1609, spotting 40 stars in the cluster. Today, there are about 1010 high-probability members, most of them (68 percent) red dwarfs. The Greeks and Romans identified the nebulous object as a manger from which two donkeys, represented by the neighbouring stars  Asellus Borealis and  Asellus Australis, were eating. The stars represent the donkeys that the god Dionysus and his tutor Silenus rode in the war against the Titans. The ancient Chinese interpreted the object as a ghost or demon riding in a carriage, calling it a "cloud of pollen blown from under willow catkins." The smaller, denser open cluster Messier 67 can also be found in Cancer, 2500 light-years from Earth. It has an area of approximately 0.5 square degrees, the size of the full Moon. It contains approximately 200 stars, the brightest of which are of the tenth magnitude. In the Egyptian records of about 2000 BC it was described as Scarabaeus (Scarab), the sacred emblem of immortality. In Babylonia the constellation was known as MUL.AL.LUL, a name which can refer to both a crab and a snapping turtle. On boundary stones, the image of a turtle or tortoise appears quite regularly and it is believed that this represents Cancer as a conventional crab has not so far been discovered on any of these monuments. There also appears to be a strong connection between the Babylonian constellation and ideas of death and a passage to the underworld, which may be the origin of these ideas in later Greek myths associated with Hercules and the Hydra. In the 12th century, an illustrated astronomical manuscript shows it as a water beetle. Albumasar writes of this sign in Flowers of Abu Ma'shar. A 1488 Latin translation depicts cancer as a large crayfish, which also is the constellation's name in most Germanic languages. Jakob Bartsch and Stanislaus Lubienitzki, in the 17th century, described it as a lobster. 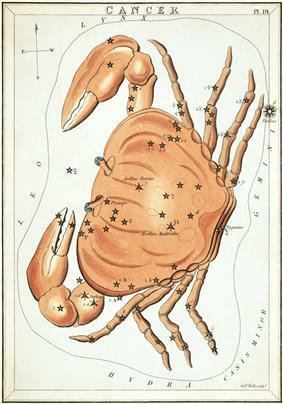 In Ancient Greece, Aratus called the crab Καρκινος (Karkinos), which was followed by Hipparchus and Ptolemy. The Alfonsine tables called it Carcinus, a Latinized form of the Greek word. Eratosthenes extended this as Καρκινος, Ονοι, και Φατνη (Karkinos, Onoi. kai fatne): the Crab, Asses, and Crib. The Indian language Sanskrit shares a common ancestor with Greek, and the Sanskrit name of Cancer is Karka and Karkata. In Telugu it is "Karkatakam", in Kannada "Karkataka" or "Kataka", in Tamil Karkatan, and in Sinhalese Kagthaca. The later Hindus knew it as Kulira, from the Greek Κολουρος (Koloyros), the term originated by Proclus. In Ancient Rome, Manilius and Ovid called the constellation Litoreus (shore-inhabiting). Astacus and Cammarus appear in various classic writers, while it is called Nepa in Cicero's De Finibus and the works of Columella, Plautus, and Varro; all of these words signify crab, lobster, or scorpion. Athanasius Kircher said that in Coptic Egypt it was Κλαρια (Klaria), the Bestia seu Statio Typhonis (the Power of Darkness). Jérôme Lalande identified this with Anubis , one of the Egyptian divinities commonly associated with Sirius. 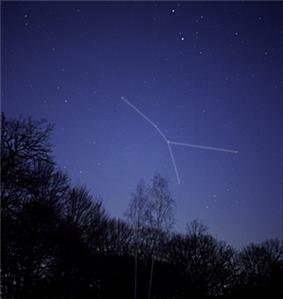 In most Germanic and Slavic languages, the constellation is known as "The Crayfish". 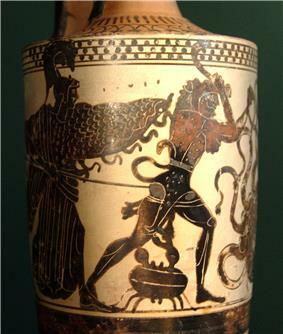 Heracles attacked by Karkinos (bottom) and the Lernaean Hydra, under the aid of Athena. White-ground Ancient Greek Attic lekythos, ca. 500–475 BC. Louvre Museum, Paris. The creation of the constellation is explained in Greek mythology by the short-lived association of the crab Karkinos with one of the Twelve Labors of Heracles, in which Heracles battled the multi-headed Lernaean Hydra. Hera had sent Karkinos to distract Heracles and put him at a disadvantage during the battle, but Heracles quickly dispatched the crab by kicking it with such force that it was propelled into the sky. Other accounts had Karkinos grabbing onto Heracles's toe with its claws, but Heracles simply crushed the crab under his foot. Hera, grateful for Karkinos's effort, gave it a place in the sky. Some scholars have suggested that Karkinos was a late addition to the myth of Heracles in order to make the Twelve Labors correspond to the twelve signs of the Zodiac. As of 2002, the Sun appears in the constellation Cancer from July 21 to August 9. In tropical astrology, the Sun is considered to be in the sign Cancer from June 21 to July 22, and in sidereal astrology, from July 16 to August 15. In Chinese astronomy, the stars of Cancer lie within the The Vermillion Bird of the South (南方朱雀, Nán Fāng Zhū Què).